Duffins are very popular in England, so I’ve read. They are a cross between a muffin and a jelly doughnut. One of the most well known and earliest recipes is from Bea’s Cake Boutique in London. She created a nutmeg spiced muffin that is dipped in butter and then in sugar and filled with raspberry jam. 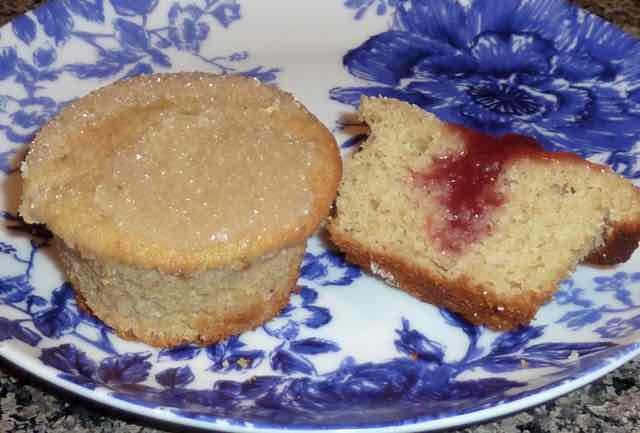 A delightful jelly doughnut muffin. I converted the original recipe into a gluten free one, but the cake was too dense for me. Everyone else really liked them, but lets face it, who is going to complain about any fresh baked treats? This time I tried it with my favorite ‘cake’ doughnut recipe and dipped the muffins in butter and then sugar. Heavenly! In some of the Duffins I put the jelly in before baking and some afterwards. Both are good, but the jelly in after baking is much closer to a jelly doughnut in taste and overall experience. I baked some in paper liners and some right in the muffin pan. The ones with no paper liners came out very easily (and in one piece). 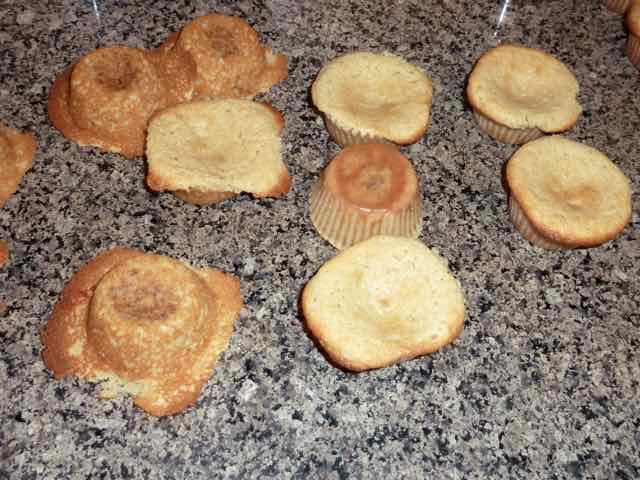 I should have used less batter without the liners as the tops spread while baking. The paper liners were a bit higher and kept the batter in place better. In the photos the whole Duffin was dipped in butter and then sugar, but I could not figure out how to dip butter over the whole thing without having to melt about a pound of butter, so I just dipped the tops. Lets hope that this craze becomes popular on this side of the pond too. And when it does, the gluten free version is ready to go. 1) Preheat oven to 350℉. 2) Line muffin pans with paper liners or grease the pans really well. I made some in liners and some in the well greased pan. Both came out easily and in one piece. 3) In a medium sized bowl add flours, nutmeg, xanthan gum, salt and baking powder. Mix with a whisk until well blended. 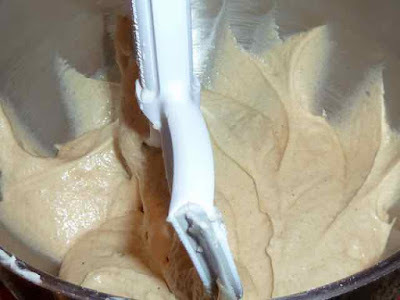 4) In a separate bowl or the bowl of a stand mixer cream sugar and butter or margarine until fluffy. 5) Add eggs or egg replacer and vanilla. Mix in well. 6) Add ⅓ of the flour mixture and mix in. Then ½ of the milk or cream or non dairy milk and mix well. Add the next ⅓ of the flour mixture and mix well. Add the rest of the milk and mix well. Finally add the rest of the flour mixture and mix until well combined. 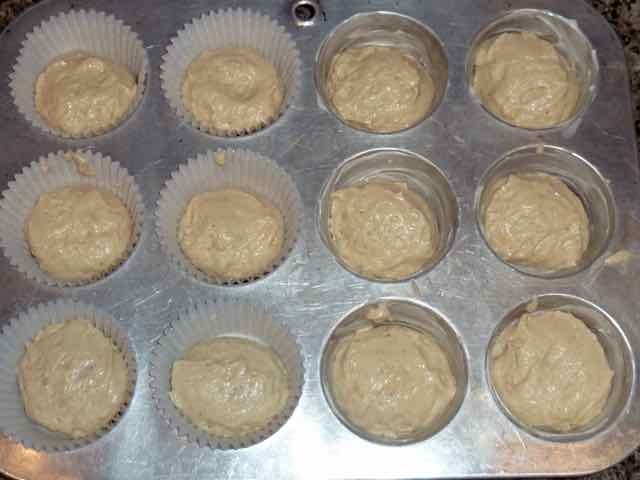 7) Fill the greased muffin tin openings or paper liners ¾ full with batter. You should fill it a bit more to ¾ full. I made some Duffins by baking the jam inside. I covered the jam with some batter before baking. 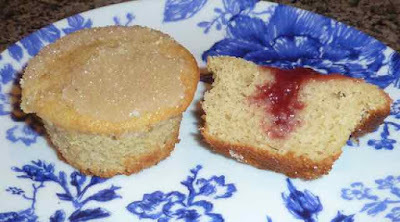 It is better to fill the Duffins with the jam after baking them. 8) Bake in the center of the oven for 20-25 minutes until the cake springs back when touched lightly with a finger or when a toothpick inserted in the center comes out clean. 9) Turn the muffins out onto a clean counter or cutting board as soon as they come out of the oven. Turn them right side up quickly. Muffins tapped out of the pan right out of the oven. 10) While still hot dip the tops in the melted butter or margarine and then into the sugar. Place on a rack to cool completely. the tops were dipped into melted butter and then sugar. 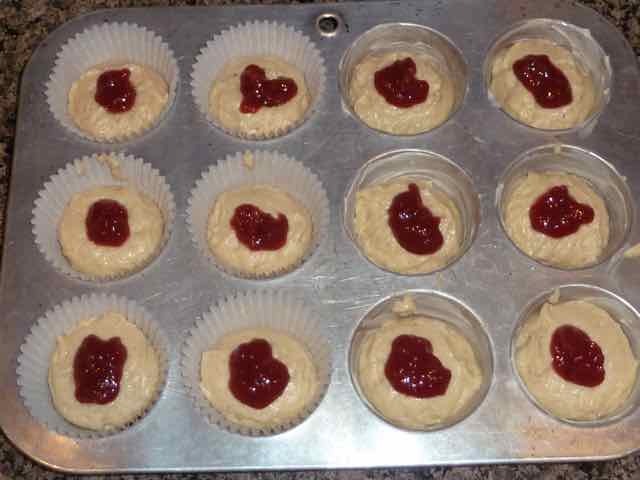 11) Use a pastry bag with a pastry filling tip to pipe some raspberry jam into each Duffin. You can go in the top or up into the bottom of each Duffin. Yum! Enjoy! GLUTEN FREE DUFFINS Makes about 18 Ingredients CAKE 1 cup Sorghum Flour ½ cup Chickpea Flour ½ cup Tapioca Flour 1 tsp. Xanthan Gum 1 tsp. Sea Salt 4 tsp. Baking Powder 1 cup Sugar (I use evaporated cane juice crystals) ½ cup Unsalted Butter or for Dairy Free ¼ cup each non hydrogenated margarine and non hydrogenated shortening 1 cup Cream or Milk - for Dairy Free use dairy free milk or creamer or choice 2 eggs Eggs (For Vegan - In a small bowl mix until frothy: ½ cup water; 2 Tbs. cornstarch; 2 tsp. oil; ¼ tsp. baking powder; and 1/8 tsp. xanthan or guar gum.) 1 tsp. Vanilla Extract FOR DIPPING 2-3 Tbs. Unsalted Butter - Melted ⅓ cup Granulated Sugar (The recipe calls for caster sugar which is superfine sugar in the USA. I did not have any so I just used granulated sugar. I think it works well since it resembled the jelly doughnuts here which must be coated in granulated sugar.) Directions 1) Preheat oven to 350℉. 2) Line muffin pans with paper liners or grease the pans really well. 3) In a medium sized bowl add flours, nutmeg, xanthan gum, salt and baking powder. Mix with a whisk until well blended. 4) In a separate bowl or the bowl of a stand mixer cream sugar and butter or margarine until fluffy. 5) Add eggs or egg replacer and vanilla. Mix in well. 6) Add ⅓ of the flour mixture and mix in. Then ½ of the milk or cream or non dairy milk and mix well. Add the next ⅓ of the flour mixture and mix well. Add the rest of the milk and mix well. Finally add the rest of the flour mixture and mix until well combined. 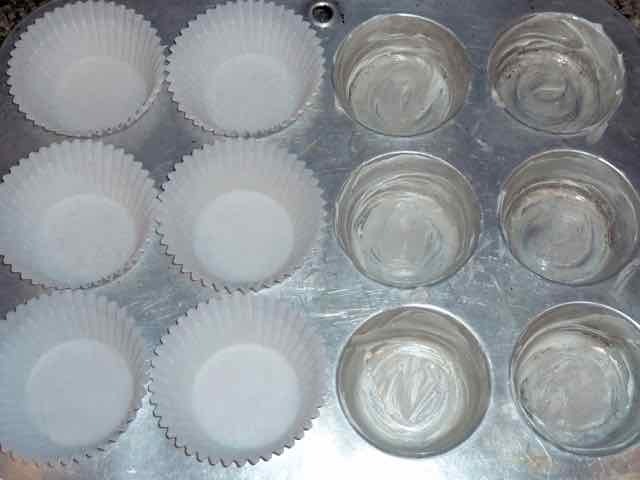 7) Fill the greased muffin tin openings or paper liners ¾ full with batter. 8) Bake in the center of the oven for 20-25 minutes until the cake springs back when touched lightly with a finger or when a toothpick inserted in the center comes out clean. 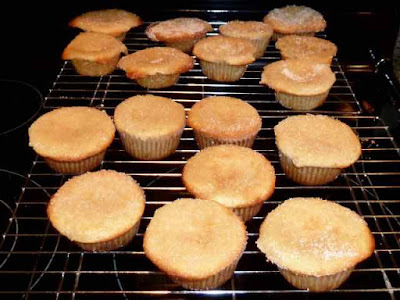 9) Turn the muffins out onto a clean counter or cutting board as soon as they come out of the oven. Turn them right side up quickly. 10) While still hot dip the tops in the melted butter or margarine and then into the sugar. Place on a rack to cool completely. 11) Use a pastry bag with a pastry filling tip to pipe some raspberry jam into each Duffin. You can go in the top or up into the bottom of each Duffin. Yum! Enjoy!